Hundreds of Ethiopian Jews and their supporters marched Monday in protest of what they claim is humiliating and racist treatment. The march, which set out from the Jerusalem Convention Center and ended in front of the prime minister's office, addressed an incident in which Ethiopian donated blood had been thrown out of a Magen David Adom blood drive. Many youths, professors, and students came to protest, along with religious leaders. During the rally in front of the prime minister's office, a policeman on horseback hit one protestor in his head. Pnina Tameno (25), spokesperson for the anti-racism headquarters who is completing a law degree, told Ynet that "the blood drive affair is the straw that broke the community's restraint. We're patient people by choice, but that doesn't mean we're weak." "Since we immigrated to Israel, ther has been no progress. Tell me if it's reasonable that we're Jews just like any other Jews, but we have a special Ethiopian rabbi and there are two more rabbis that are for the whole country," added. Tameno saw with her own eyes the young man injured by the policeman's club: "We're against violence and we said so to the protestors, but for no reason, a policeman came along on horseback and hit one of the protestors with his club, cutting his head open." "The protestor was simply holding a sign. 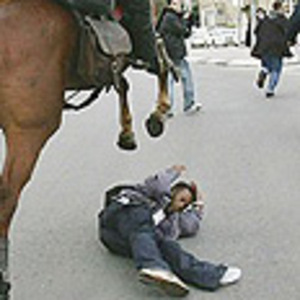 After the man fell down, the horse trampled him. What's even worse is that, despite the fact that so many policemen came to the rally, there wasn't even one ambulance and we had to wait ten minutes for one to arrive." This is the second time MDA has been caught dumping Ethiopian blood. There were protests then and there are again now. Perhaps you should make this rather simple fact known to MDA. You can do so here. American Jewish World Service has launched a call to action on Darfur. The petition, which can be signed here, calls for an expanded US role in ending the genocide. Let's hope it works. … Naked but for a pair of bangles on his ankles and white dust caking his skin, the four-year-old had collapsed a few steps from a group of starving children sheltering under a tree. It was as if he had been discarded. All this in what should have been a place of celebration. The northern government in Khartoum and the southern rebels of the Sudan People's Liberation Army had signed a peace deal in January to worldwide applause. On paper at least, Africa's longest civil war was over. Unlike the relatively young conflict in Sudan's western Darfur region, fighting in the south has raged on an off for almost half a century. But now the country had defied the cynics: peace seemed possible. Rich countries meeting in Oslo had promised billions of dollars in reconstruction aid only a few weeks before our visit -- but where was the money? Not in Paliang. … I passed the boy lying in the dust. A faint movement stirred his ribs: he was breathing. I realized I had been mistaken -- he had not been abandoned -- a woman was sitting a few yards away watching. Mother and son would starve together.